$190.00 Medal for Rescuing a Drowning Person, 1970s-80s. In near mint condition. $190.00 Medal for Rescuing a Drowning Person, transitional post- Soviet issue, 1992-1994. Near mint condition. $110.00 Medal for Valor During a Fire, Var. 2, 1960s - 80s issue. In outstanding condition. $180.00 Document for a Medal for Valor during a Fire, 1972. Very uncommon special military issue. Shows stamp of Moscow Military District and facsimile signature of its commander Col. General Govorov. In excellent condition. $750.00 Medal for Valiant Labor, Type 1, Var. 1, #11246, circa mid to late 1942. Excellent example on original suspension. $1,350.00 Medal for Valiant Labor, Type 1, Var. 1, #10191, with a document, awarded in April 1942. Both the medal and document are in superb condition; this set is literally impossible to upgrade. $1,200.00 Medal for Valiant Labor, Type 1, Var. 2 (with thick screw post and Monetnyi Dvor screw plate), #21631, with award document, October 1943 issue. An uncommon mid-Patriotic War award. Both the medal and document are in excellent condition. $55.00 Medal for Valiant Labor, Type 2 Var. 2, sub-variation with a flat eyelet, circa 1950s-60s. In excellent condition. Includes original brass suspension. $25.00 Medal for Valiant Labor, Type 2 Var 2, sub-variation with rounded eyelet, 1960s-1980s issue. $695.00 Medal for Distinguished Labor, Type 1, Var. 1 ("Mondvor"), #13114, circa 1942 issue. A superb example. Comes on complete original triangular suspension with original ribbon. $20.00 Medal for Distinguished Labor, Type 2, Var. 2 (unnumbered), sub-variation with rounded eyelet, 1960s-1980s. In silver and enamel. Excellent conditon. $45.00 Medal for Distinguished Labor, Type 2 Var 2, sub-variation with a flat eyelet, circa 1950s-60s. In excellent condition, comes on original brass suspension. $4.00 Labor Veteran Medal, variation with mint marked eyelet, 1970s- 80s. In excellent condition. $20.00 Document for a Labor Veteran Medal, an extremely uncommon 1989 issue by the Kiev Military District. In excellent condition. $10.00 Document for Labor Veteran Medal, 1970s-80s. Very good to excellent condition. 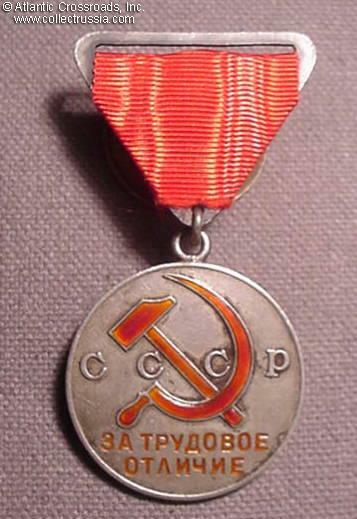 $10.00 Medal for Meritorious Labor During the Great Patriotic War, Var. 2 1940s-50s. In excellent condition and includes original brass suspension. $15.00 Award Document for a Medal for Meritorious Labor during the Great Patriotic War, July 1946 issue. In excellent condition. $80.00 Medal for Restoration of the Ferrous Metallurgy of the South, late 1940s - early 50s. Excellent example on original suspension. $20.00 Medal for Development of the Virgin Lands, late 1950s-early 1960s. In excellent condition. $25.00 Medal for Development of the Virgin Lands, Variation 2, circa 1960s-70s. In excellent condition. $40.00 Document for a Medal for Development of the Virgin Lands. A relatively early, 1958 issue from the Pavlograd Region in Kazakhstan. In very good to excellent condition. $130.00 Medal for Reclaiming of Non-Black Soil Region, 1980s. In near mint condition. $240.00 Document for a Medal for Reclaiming of Non-Black Soil Region, awarded in 1983 to a woman. A very scarce award certificate in excellent condition. $195.00 Medal for Development of Oil and Gas Industry of Western Siberia, late 1970s-80s. In near mint condition.